12일(한국시간) 코인마켓캘린더(coinmarketcal.com)에 따르면 카르다노는 오는 13일(현지시간) 주크에서 밋업을 진행하는 것으로 전해졌다. 카르다노는 에이다 암호화폐에 대한 블록체인을 실행하는 분산형 컴퓨팅 플랫폼이다. 한편 카르다노는 이날 코인마켓캡에서 2.71% 오른 0.1803 달러에 거래되고 있다. 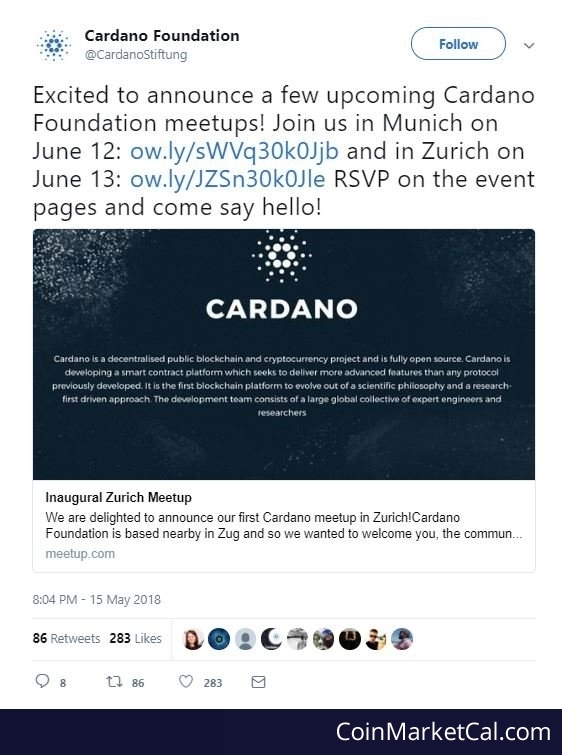 Cardano(ADA) will be held a meetup in Zurich on the 13th. According to the Coin Market Calendar(coinmarketcal.com) on the 12th(korea time), ADA reported to hold a meeting in Zurich on the 13th(local time). Cardano is a distributed computing platform that runs the blockchain for ADA cryptocurrency. ADA is traded at 0.1803 dollars, up 2.71 percent on coinmarketcap from the previous day.